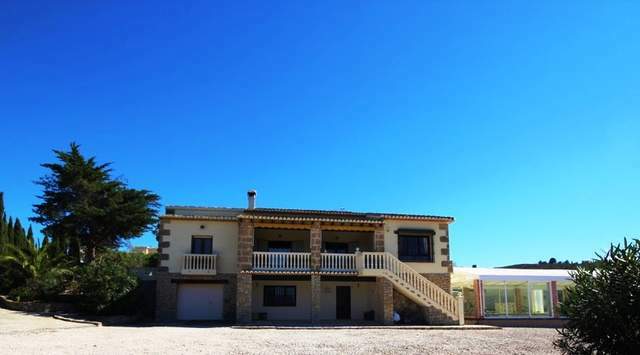 A truly stunning Finca of 392m2, set on a beautiful 9052 m2.plot, located on the outskirts of the charming and traditional village of Lliber, just 15 minutes drive to our fabulous coastline. This fabulous property consists of three distinct areas. 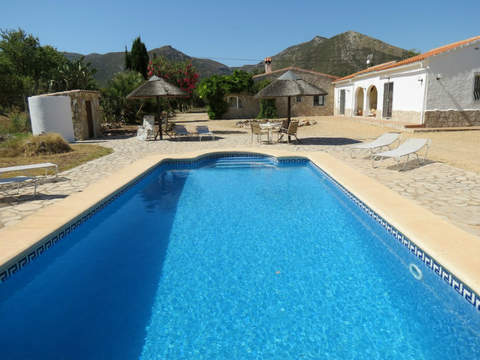 There are cultivated grapes, plus a large orchard with numerous almond and various fruit trees, all of which is complemented by the large and impressive traditional finca full of character, charm and many high quality fixtures and fittings throughout. Access to the property is via automatic gates leading into the ample parking area with space for several vehicles, plus a covered car port. There is a beautiful outdoor area with completely private swimming pool, surrounded by wonderful terraced areas complete with outdoor kitchen / barbeque, traditional bread oven and a lovely summer pergola with ample space to entertain and at the same time enjoying fantastic panoramic views of the surrounding mountains. Adjacent to the pool is the spacious self contained guest apartment known in Spanish as casita, comprising of a large lounge with open plan kitchen, a double bedroom and shower room. The main dwelling entrance leads into a light and welcoming hallway, which then leads into the large lounge, full of traditional charm, From here you enter a light and airy dining room, again constructed and furnished in traditional style, having windows that overlook a lovely interior terrace full of colour and stunning plants and trees There is a wonderful, fully equipped kitchen with fine quality units and appliances. Above the kitchen stairs lead up to a mezzanine suitable for a reading or music, area or office. There is also a bathroom with shower for general use. On the right of the entrance there is a wonderful second large dining room from which the bedrooms are accessed. On the ground floor there are two large, double bedrooms each with a private bathroom with shower, and both bedrooms having fitted wardrobes, A spectacular staircase leads to the upper floor where there is another superb lounge. There is also a third double bedroom, currently used as office with access to a large conservatory, again having amazing panoramic views; this is an ideal place of an amazing master bedroom with en-suite and dressing room. This superb property simply exudes charm and character, being constructed to the highest standards and producing a simply marvelous mixture of old world charm, but having retained the finest modern finishing, and with a highly impressive attention to detail throughout. With hot and cold air conditioning in bedrooms, gas fired central heating to radiators, double glazing, low maintenance, mature gardens etc, this very impressive property which simply has to be viewed in order to be fully appreciated.